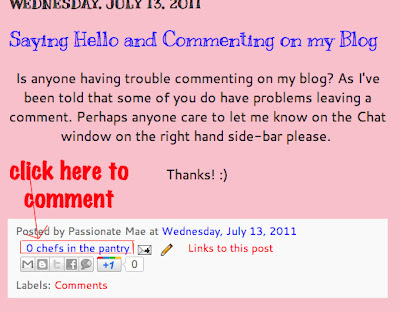 Passionatemae | Food has a way of bringing people together: How to leave a Comment on the blog? How to leave a Comment on the blog? 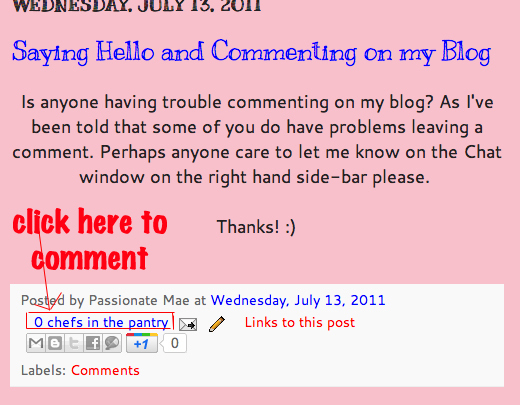 2) Click on the "0 chefs in the pantry"
4) Choose "Post to Comment" or "Preview"
Hopefully, you wouldn't have any problems leaving a comment now. Hi there, just became aware of your blog by way of Google, and found that it's really informative. I'm going to watch out for brussels. I'll appreciate for those who continue this in future. Loads of people today is going to be benefited from your writing. Cheers! anon: thank you so much! hope you'll keep on supporting! Thanks a lot, very helpful. My website is about [url=http://www.depressionsymptomsmedication.com]Childhood depression[/url]. When will you post again ? Been looking forward to this ! Great info, sweetie! I'll be happy to read more! By the way, I suggest you should make your blog a little more social. some great content here. how often do you update? Thanks for pointing the way to post right comments! I'll keep that in mind! Thanks for the tips, honey! I'll consider this in future. How to use Demerara Sugar? What I have been up to lately? How to know when the oil is hot enough?